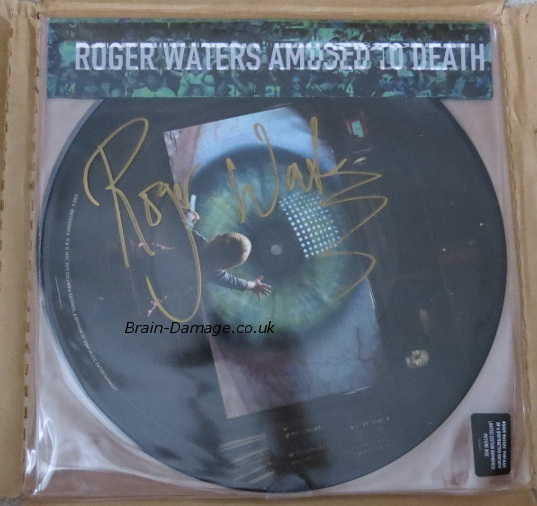 Pink Floyd news :: Brain Damage - Amused To Death: James Guthrie interview; win Roger Waters-signed picture disc! Amused To Death: James Guthrie interview; win Roger Waters-signed picture disc! The new, surround sound remix of Amused to Death was world-premiered on April 10th, 2014 during a Pink Floyd conference at Princeton University. After a delay of over one year from that first playback, the album is finally released worldwide today, July 24th. As part of our release day celebrations for this long-awaited major update to Roger Waters 1992 classic, Brain Damage recently caught up with producer and engineer James Guthrie to discuss the album's sojourn. Brain Damage: It has been a year and three months since the Princeton University conference where the remix of Amused to Death was world-premiered: was the delay frustrating? BD: What caused the delay? There were numerous reasons and I'm probably not aware of them all. The first was that Legacy wanted Roger to do some interviews and promotion for the album and he was busy finishing his film which was a full-time job. The labels have various reasons for picking release dates that coincide with specific events in order to maximize their promotion efforts. BD: Is this remix release giving the album a chance for recognition on a larger scale? I hope so. It's a very important piece of work and needs to be heard. This is far more than just entertainment. BD: Does Amused to Death's message resonate today and how much did you ponder this as you remixed the album? In my opinion, it resonates deeper than ever today. Aldous Huxley warned the world in 1932, George Orwell in 1949, and Roger reminded us in 1992. The dangers are ever more present with the current level of technology and social media. The messages of this album have been a concern of my own probably since reading Brave New World and 1984 as a kid, so I thought about it every day, all the way from gathering the original elements, and through completion of the final mix. BD: You have mentioned the remix effort was complicated by the length of time the album took to record, spanning substantive technological changes. Can you tell us the type of recording technology Amused to Death spanned? Roger wrote and recorded this album over a period of about five years. He began on 24-track analogue tape and then expanded to 48 tracks. Digital multitrack technology was still in its early days, but Nick Griffiths ["Amused to Death" co-producer and engineer] decided to move everything to Mitsubishi X850 32-track digital. I think he may have been concerned about the build-up of noise as they went to more and more work reels, although I can't be sure. The analogue multitracks are Dolby SR, so noise is not really a big issue. Perhaps he was just seduced by the new technology. Finally, they went to a third format with a Sony 48-track digital machine (3348). When I got involved, ostensibly to 'mix' the album, I insisted on using the earliest generation that existed of every element. The result was that we sometimes had four multitrack tape machines running on each mix. I say ostensibly, because … there is a potential trap to fall into here. When you are in 'overdub' mode during the making of a record, there can be a tendency to default to a very similar balance of the songs from day-to-day as you overdub. If you're not careful, you may begin mixing from that same balance, rather than taking a fresh view of the song. Coming in as the 'new blood' to the project, I had never been exposed to their default balances. Now, this is not to say that the mixing stage needs new blood, certainly not. Just an open mind and the ability not to become too attached to what you did earlier, works very well. On day one, Roger left me alone to mix the first song – he came into the studio that night to have a listen and I guess my balance and approach must have been quite different to what he had been used to hearing. As the song finished, he sat quietly for a minute and then said, 'Wow, I hadn't thought of it like that. Now that I hear it this way, I think I can sing it better'. The next thing you know, we were in heavy overdub mode! This included a few overdubs in some cases to a full re-record of "It's A Miracle", which had previously been up tempo. Even the cross-fade sections became full blown mixes in their own right as we added more and more elements, so I ended up doing a lot of recording work in addition to the mix. Needless to say, this was an enormously complex stereo mix. I wanted to do a proper 5.1 mix of the album ever since the format first emerged, but the sheer complexity of finding hundreds of tapes and individual elements, together with the question of whether or not the digital tapes would even play, made this an immensely daunting prospect. The elements for the album exist on so many different formats, and the documentation is severely remiss – it was a very tall order that had always pushed the project deep into the background. I think everyone just assumed that it couldn't be done. BD: What limitations did the variety of recording formats create in the remastering and remixing process? There weren't really limitations, just challenges. Coaxing the tapes to play, finding all the elements and essentially re-building the album before I could even begin mixing was very tricky. In the end we were actually still unearthing last minute elements – even as I was mixing. BD: How does the vision for a 5.1 Surround Sound remix develop, i.e., how much does it have to do with what the artist envisions vs. what you as a producer and engineer envision? Initially it's left up to me. I create a mix that I think works and then I play it for the artist to get their input. I take notes and then make the appropriate changes. The approach to a 5.1 mix depends on how faithful you need to be to the original. If the original stereo mix has a powerful emotional impact, then your first job is to try to equal, or surpass it. If you fall short on how the piece works musically and how it delivers emotionally, then no amount of immersive 5.1 trickery is going to salvage the mix. It will, to my mind, have failed. "The Dark Side of the Moon", "Wish You Were Here", and "Amused to Death" are all very powerful in stereo, so you have a big responsibility to the original. Some albums have less satisfying stereo mixes and there your job is easier. BD: What is the most compelling factor in the decision to remaster and remix an album and (alternatively) what do you feel renders that pursuit premature: is it a technological issue, an album's anniversary, or a commercial consideration? For me, you do it because the music deserves the treatment. You do it for the legacy of the artist. You do it because the fans want it. I'm not really that concerned about album anniversaries, and commercial considerations for a band like Pink Floyd are perhaps less important than they are for some other bands (the record company would of course disagree with me). But you should be doing these things for artistic reasons. The timing can often coincide with new technology (better digital converters, the availability of SACD, etc.) but ultimately these decisions should be based on the importance of the music. I wanted to do "Amused to Death" because it contains some of Roger's finest work. BD: Ironically, as technology improves and widens the opportunity to re-frame albums (as you have with Amused to Death) we seem to spiral further into a vortex of background and compressed music... Will that diminish the possibilities and incentives for full album remasters and remixes in the future? I'm hoping that the trend is moving the other way. These things are cyclic and we've wallowed far too long in the quagmire of compressed music. The interest in 5.1 mixes, the interest in vinyl and hi-res downloads tells me that people are starved for the full harmonic experience. From my first days in the studio I have questioned why the public can't experience the same quality and resolution that we work with in the studio. There was always a step down in quality for consumer release formats. Now we are in a position to give the fans something much closer and we need to do that. BD: In the year you waited to finally release what was an otherwise finished remix, did you feel any urge to go back and tweak anything or redo any small detail or is the remix exactly where it was when it was premiered at Princeton University? The mix that is being released on the 24th is the same one that I played at Princeton. The fans that came to Princeton just got a preview one year in advance! BD: Were you happy with the way the remix was received at Princeton University? Yes. It was great getting such positive feedback. Everybody was so generous. I rarely get to see the look on fan's faces when they hear something for the first time so it was thrilling for me. Brain Damage thanks James for his time and for sharing his thoughts with the Floyd community! Please use our links to Amazon wherever possible; each purchase made after entering their sites using our links provides a small but vital contribution towards our ongoing running costs, and is much appreciated! COMPETITION - WIN THE LIMITED, NUMBERED PICTURE DISC SIGNED PERSONALLY BY ROGER WATERS!